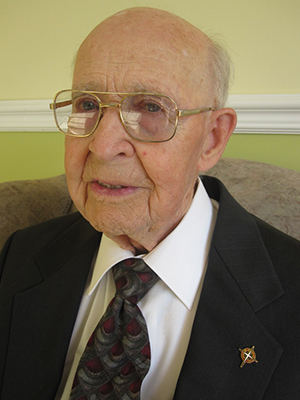 Brother Alphonse Boutin (Brother Edmond), of the Francophone Canada District, a longtime science teacher, passed away on June 16, at Sacré-Cœur Hospital, in Montréal (Québec). He was 101 years and 8 months old. Until the very last days, he was retired at the Brothers’ nursing home in Laval (Québec), where he arrived in 2011, coming from the other nursing home the Brothers had in Québec City. Viewing in Toussaint-Dufresne Hall all afternoon and evening; community prayer at 7:30 p.m. Viewing at Lépine-Cloutier Funeral Home, 1025, route de l’Église, Québec City, from 3:00 p.m. to 9:00 p.m. Viewing at Lépine-Cloutier Funeral Home, 1025, route de l’Église, Québec City, from 11:00 a.m.
Mass of Christian Burial at 2:00 p.m. in Saint John Baptist de La Salle church, located at the corner of De Chèvremont and Biencourt streets, Québec City. Luncheon to follow. The ashes will be buried later in Notre-Dame de Belmont Cemetery, Québec City.